Are Any Slot Games Better Than Others? If you take your gaming action seriously you're always trying to gain an edge over a situation. When it comes to slots, edges are quite rare because of the complete randomness of the games. Players are always trying to find the best game to play to increase their chances of winning. But are there game options that are better than others? Are seven-reel games better than three or five-reel games? How does a player maximize their chances to win money? This article covers factors that make some games better than others and reasons why. Online slot games are not set up like a live casino where you can walk around and find out the payout percentages of each game. In a live casino, some games will have a higher payout percentage than others. But an online casino doesn't do this. Online the overall payout percentages will be higher than live casino games because the online casino doesn't have all the overhead that live ones do. They can pay out more winnings to the players because they don't have to build, and staff, elaborate resorts to attract the casino action. Overall, payouts are higher at online casinos. Online seven-reel games don't have higher payouts than three-reel games do, and your chances of wining won't change greatly from one game to another. Progressive games often don't pay many smaller hits because the big progressive jackpot makes up such a large percentage of the overall payout of the game. But when these games grow a big jackpot they become a good bet because the eventual payout is so big. The only way a player can improve their chances to win more playing online slots is by playing the biggest stakes that they can afford to play. The bigger the stakes the bigger, exponentially, the payout will be on a big hit. That's what slots play is; you play a losing game until that one hit pays you big time. The bigger the bet the more you'll win when that big one hits. It's just like making sure that you play max bet in a progressive game, you want to be betting as much as you can when the miracle falls on your lap. Many casinos list their recent winnings and the games that were played. This is useful to evaluate if a slots game is looser than another and might make you want to play that game versus another slots machine that has had any recent winners. Look at the picture. This data is for February 2016 from Slotland Casino. 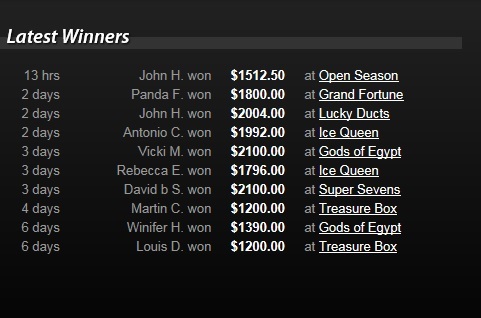 You can see slots games Ice Box, Treasure Queen, and Gods of Egypt have had more winners for the period covered than others. Are these the machines to play on. It seems there is greated likelihood of a winning outcome on these machines than others. Of course, past results don't indicate future outcomes but if taking a chance it could be a better bet to play these games over others. Chris G won $12,834.36 on Naughty or Nice? Here you see several winners for Enchanted Garden Slots game, Aladdin's Wishes also has several winners. There may be a hope these games continue their winning streak as you go to play. It may be right. Machines payback over the life of the game. So right now might be the right time to play. But it's not an indication of a winning outcome, but there's likelihood of winning outcome based on recent results. Some slots games don't payoff for along time then payout frequently for a limited time. It's all a game of chance. Another factor that make a slots game better than others is personal preference. With the advances in computer special effects for home computers and cellphones, has come slots games with special effects that maybe standard now but were unthinkable several years ago. One example is the bonus feature guarantee type slots game . To get a bonus round, a player has an option to click the feature guarantee. In do so, a fabulous wheel is spun and if lucky the player gets a bonus free spin round. It's a mulit-color collection of blinking lights and wheels spinning that is fascinating to look at. And during some spins, some of the rows on the reels will change into a special character associated with the scatter symbols. Along with the opportunity to win money is also a visual stimulating slots game. This factor could make this a personal preference slots game due to the special effects. Online slots machines have menus. You can clearly see the jackpot amounts. In a land based casino it's not so easy to see. You have to find the slots machine section and sometimes feel lucky to do that with all the distractions. Sometimes, you may be thinking "Does anyone know you are gambling?" And after finding the machine, it's easy to forget to check to see if there is a jackpot of any kind. With online slots games, all the information is out there in the menu and is usually on top of the machine as well. It's often easier to find and play larger progressive slots jackpot machines at the online slots casino. There are some factors that make some slots games better than others. These factors include winning history, payout percentages, special effects, personal preferences and ability to play on large jackpot machines. If some slots are better than others these factors must be brought into the equation and analyzed on an individual basis. Any player might find playing on a certain slots machine "better" for any of the reasons mentioned above.